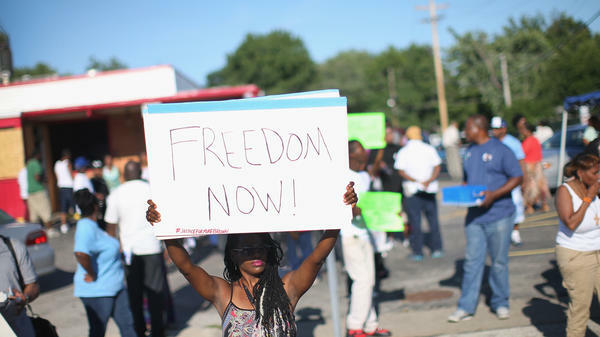 A Demonstrator protesting the shooting death of teenager Michael Brown holds up a sign Wednesday in Ferguson, Missouri. A police officer watches over demonstrators protesting the shooting death of teenager Michael Brown on Wednesday in Ferguson, Missouri. Brown was shot and killed by a Ferguson police officer on Saturday. Ferguson, a suburb north of St. Louis, has experienced three days of violent protests since the killing. The Associated Press said Ferguson Police Chief Tom Jackson didn't respond to a request for comment, but Los Angeles Times reporter Matthew Pearce said that, when reached, Jackson reacted with shock about the situation, and a few minutes later told him he'd ordered the reporters' release. 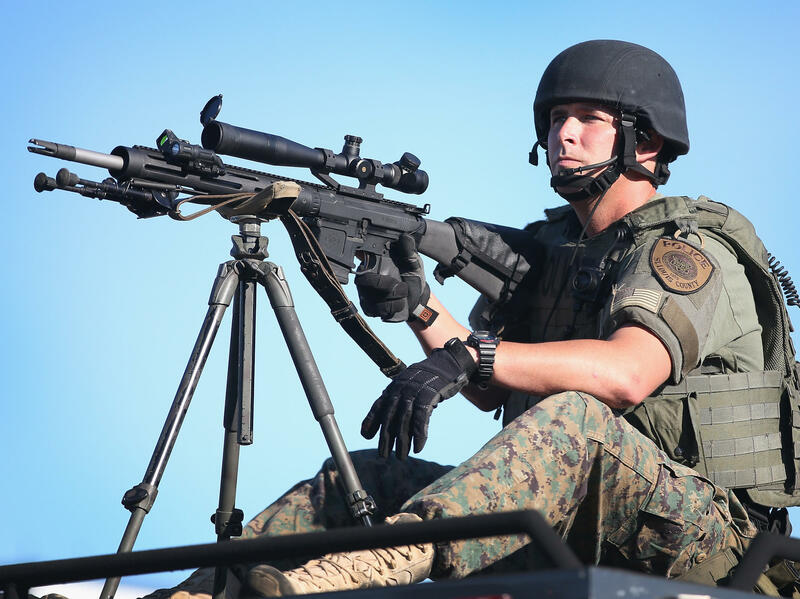 The St. Louis Post-Dispatch reports that the arrests followed another tense day of protests. A march down West Florissant Avenue from Chambers Road ended at the corner of Canfield Drive, not far from where Michael Brown was shot. A crowd of about 100 people congregated at the corner. They were surrounded on three sides by police who were keeping their distance. Many were calmly repeating the now-familiar chant, "No justice, no peace." Among them, a group of about seven young men were angrily yelling and demanding that police officials release the name of the police officer who shot Michael Brown. Later three armored vehicles approached the crowd, which had been largely quiet and peaceful. Some members of the crowd grew agitated. Authorities in a St. Louis suburb where an unarmed black teen was shot and killed by a police officer have used tear gas to try to disperse protesters after flaming projectiles were thrown from the crowd. Police also used smoke bombs Wednesday night, after directing people to go home. Helicopters circled overhead and smoke hung in the air. Two local civil rights groups – the Austin Police Accountability Coalition and the Peaceful Streets Project – gathered in front of City Hall this morning to protest Friday’s fatal officer-involved shooting.